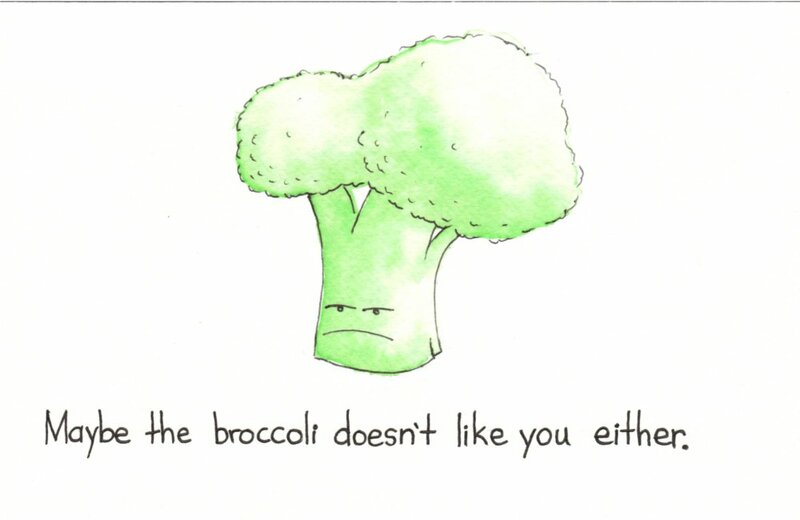 Maybe the broccoli doesn’t like you either. I always hear people complaining about broccoli. It seems to be an unpopular vegetable. Personally, I love broccoli. I can only assume it loves me too. 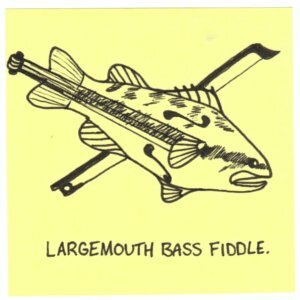 Largemouth bass fiddle and the chaos theory. If you are a bass fisherman, I apologize for the inaccurate rendering of the fish. If you are a bass fiddle player, I apologize for the rendering of the fiddle. 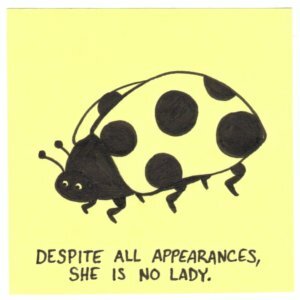 If you don’t like bad puns, you should probably visit a different website. I can’t apologize for everything. 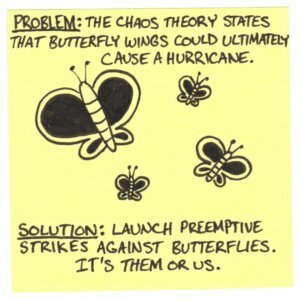 I think most people are familiar with the Chaos Theory (thank you Jurassic Park). If you have heard the theory before, the explanation in the drawing will sound very simplistic and somewhat slanted. If you haven’t, please ignore the previous sentence. 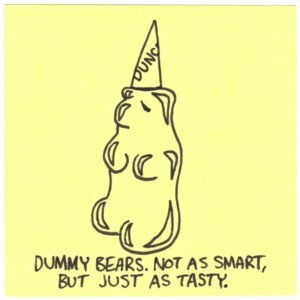 Dummy bears and restless peg syndrome. I hate gummy bears. For some reason they hurt my teeth. Still, they’re not as bad as Skittles. Skittles make my upper lip sweat. Yes, really. 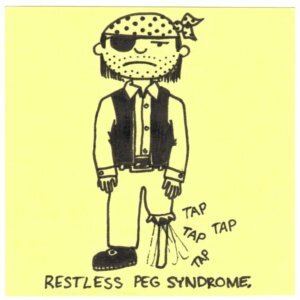 Ever see those ads on television for restless leg syndrome? This is the same- just funnier. 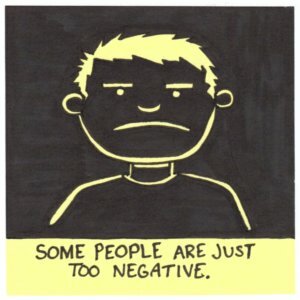 Negative people and a ladybug. This drawing took at least twice as long to draw as the average. I finally gave up trying to fill in all the space with my fine-tipped pen and switched to a Sharpie. It was much quicker, but also much more damaging to my brain because I forgot to open a window. As you can see, I drew the same cartoon twice. They are as close to being exact copies as I can manage without tracing. I decided to draw it twice because I had just finished the top picture when I thought of a funnier caption (dang it!). 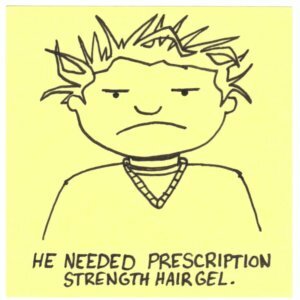 Although these drawing are only small sketches on yellow sticky notes, my limited drawing skills make creating them a laborious process. In other words it takes time. With one child and another on the way in a few short weeks, time is something I simply don’t have. I suppose I could have just photoshopped the images, but……………… I……………… um…………….. (dang it!). I should have just photoshopped it. 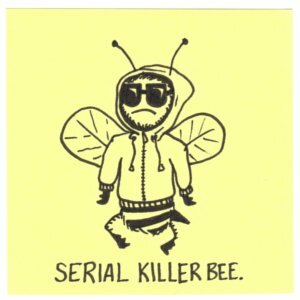 Overdressed penguins and serial killer bees. It took 6 months before anyone noticed. While I have taken some good natured ribbing from coworkers, obviously my weekly wardrobe routine was not as socially awkward as one might have thought. 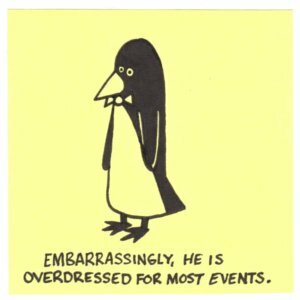 Besides, Einstein wore the exact same outfit every day. Obviously, I’m just a borderline genius. This is my best attempt at a unibomber-ish insect. 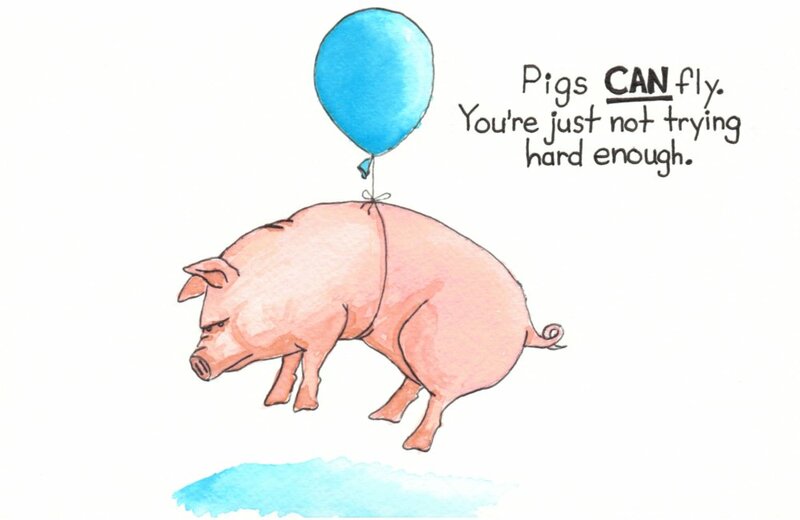 Another pig-focused drawing. Unlike most of the other pictures I’ve posted, this one could almost be inspirational. Almost. 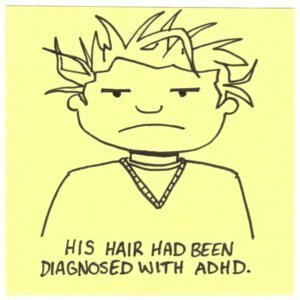 You are currently browsing the Inkjot blog archives for February, 2010.